A sphincter muscle encircling the upper end of the esophagus. The cricopharyngeus muscle, also called the upper esophageal sphincter or UES, is almost always in a contracted state, even during sleep. Its action is like a continually clenched fist. 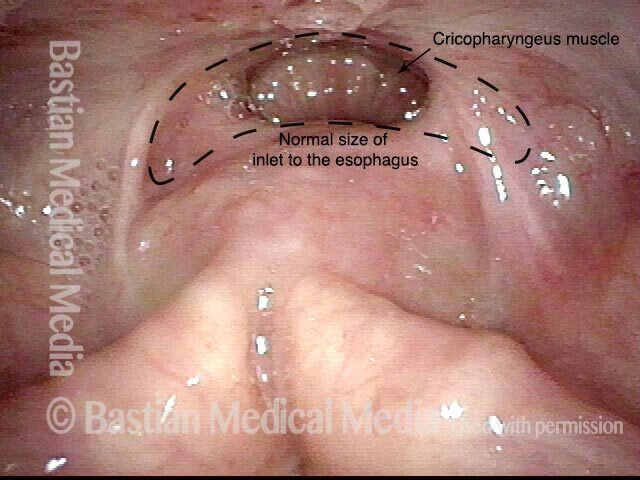 This contraction closes off the entrance to the esophagus. Whenever a person swallows, the cricopharyngeus muscle momentarily relaxes, opening its grip and allowing food or liquid to pass through and enter the esophagus. The cricopharyngeus muscle is subject to one of two disorders. Cricopharyngeal dysfunction is the failure of the muscle to relax, which causes swallowing difficulty. Cricopharyngeal spasm is hyper-contraction of the muscle, which causes a sensation of a lump in the throat but without interfering with swallowing. Close-up view of the cricopharyngeus muscle. When contracted like this, the muscle squeezes shut the entrance to the esophagus. When a person swallows, the muscle relaxes, and the entrance to the esophagus opens dramatically to let food or liquid enter. Same image as photo 1, but a small solid oval marks the center-point of the muscle’s grip, when contracted, and a larger dotted oval shows roughly how large the opening becomes when the muscle relaxes. Also, a yellow dotted line indicates the line of incision used when performing a cricopharyngeal myotomy (not needed in this patient). More distant view of the cricopharyngeus muscle, as the camera has retracted upward and is now sitting in the postcricoid part of the hypopharynx, looking downward. Much more distant view yet of the cricopharyngeus muscle, now framed within the hypopharyngeal inlet to the esophagus, at the top-center of the photo. Also now in view are the arytenoid mounds, at the bottom of the photo. Incidentally, this patient’s hypopharyngeal inlet to the esophagus is abnormally narrowed, due to post-surgery scarring; black dotted lines indicates the normal size of this inlet. This man is performing a trumpet maneuver in order to open the post-arytenoid and post-cricoid area of the hypopharynx. He is able to reveal the opening to the esophagus (dark oval). A = arytenoid mound apices. At closer range, the "shelf" of the cricopharyngeus muscle is seen posteriorly (upper photo). The radial lines on the slightly relaxed / open muscle should be compared with photo 4, where the sphincter is completely closed. 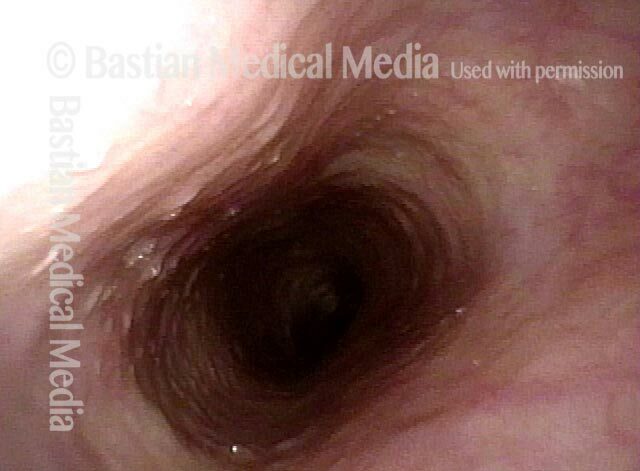 After passing through the sphincter, a view of the open cervical esophagus. Back again above the sphincter, now in closed (contracted) position. This entry was posted in Multimedia Encyclopedia and tagged Anatomy & Physiology, Education, Photos, Sphincter muscle by admin. Bookmark the permalink.